The Remix 59 is unavailable in this color. Pick another color to get on the water faster or join the wait list. The world works in cyclical ways and whitewater kayaks have progressed tons over the last several years. Change in the sport has taken us to unimaginable places and we have been proud to be driving that change. That said, as boats have gotten shorter, a fundamental concept is in danger of being lost. With the help of dozens of instructors, we designed the Remix series to carve, to glide and to provide beginners, intermediates and experts with that age old rush that comes with speed. Perfect for novices and instructors excited about rolling and proper eddy turns, big water junkies wanting to safely push their limits or experienced racers looking to cash-in, the Remix is a new concept altogether that combines the clear advantages of a relatively narrow and longer hull platform with modern chine placement to create an unrivaled comfortable, stable and responsive package. We're not talking about a dud here that's too long to turn or too wide to edge. We're talking about a boat that travels smoothly and easily over the water and, thanks to extra width at the ends, provides reassuring stability. We're talking about a boat that carves like a ski when put on edge, stays on the surface when running drops, has a fast hull for catching waves that others just can't catch, rolls easily and inspires confidence. Like an updated classic tune with its new, funky, progressive backbeat, the Remix blends the soul of the past with the technology of present in a vision for the future. If your inseam is less than 32 inches, consider getting a FREE Blukhead Plate at checkout by adding the model specific B-Plate to your cart and using code FREEBPLATE. 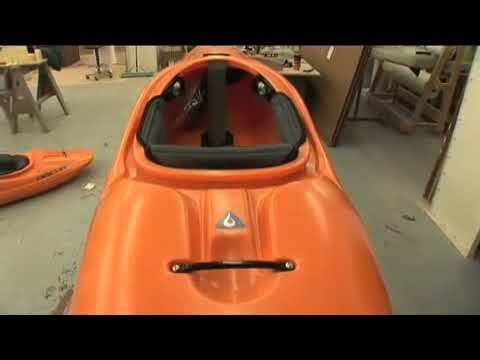 The larger B-Plate will replace the stock B-Plate giving you a better fit in your kayak. The B-Plate can be found under the Parts section in our online store. Yes, you can adjust the set back and forth as well as the foot braces and thigh braces to get the perfect fit for you. The boat also comes with hip pads with shims to give you a comfortable fit at the hips. We also offer a seat riser pad (APAD006) that slides underneath the sewn seat glove to lift you up, if you prefer to be higher up in the boat.